Apple has released the third beta versions of iOS 12.3 and macOS Mojave 10.14.5 for users enrolled in the beta testing programs. Separately, new beta version of tvOS 12.3 and watchOS 5.2.1 are also available for beta testers. Apple has released the second beta versions of MacOS Mojave 10.14.5 and iOS 12.3 for users participating in the beta testing programs. Typically a developer beta arrives first, soon followed by a public beta of the same build. Additionally, new beta builds are available for tvOS 12.3 and watchOS 5.2.1. 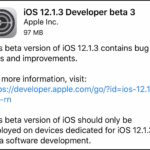 Apple has released iOS 12.3 beta 1 for users enrolled in the beta testing programs for iPhone and iPad system software, along with macOS Mojave 10.14.5 beta 1 for Mac users in the beta testing programs. Beta builds typically roll out to developers first and then later to public beta testers. Apple has released the sixth beta version of MacOS Mojave 10.14.4 and iOS 12.2 for users engaged in the beta testing programs for Apple system software. Both developer beta and public beta builds are available. Apple has released the fifth beta versions of iOS 12.2 and macOS Mojave 10.14.4 for users enrolled in the beta testing programs. Typically a developer beta rolls out first, soon followed by a public beta of the same build. Additionally, new beta builds are available for tvOS 12.2 and watchOS 5.2. 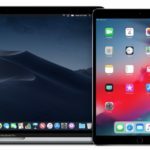 Apple has released the fourth beta versions of macOS Mojave 10.14.4, iOS 12.2, tvOS 12.2, and watchOS 5.2 to users participating in the beta testing programs for Apple system software. Typically the developer beta build rolls out first, soon followed by the equivalent as a public beta version. 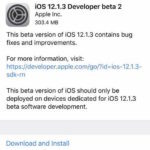 Apple has released iOS 12.2 beta 3 to users enrolled in the beta testing program for iPhone and iPad system software. The new iOS beta build arrives alongside tvOS 12.2 beta 3 and watchOS 5.2 beta 3, while macOS 10.14.4 beta 3 was released a day earlier. 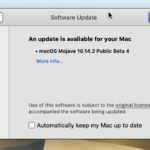 Apple has released the third beta version of macOS Mojave 10.14.4 to Mac users enrolled in the beta testing programs for system software. The developer beta is typically available first, with a public beta release available soon after. Apple has released the second beta versions of iOS 12.2 and macOS Mojave 10.14.4 for users enrolled in the respective beta testing programs. 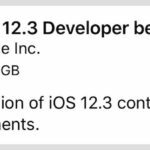 Apple has released a new beta for iOS 12.1.3 and macOS Mojave 10.14.3, along with a second beta for tvOS 12.1.2. The new beta versions are available for developer testing initially, and are typically soon followed by public beta releases. Apple has released the fourth beta version of macOS Mojave 10.14.2 to Mac users enrolled in the Mojave beta testing program. 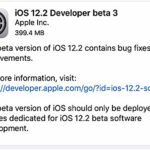 Apple has released the third beta versions of iOS 12.1.1 and MacOS Mojave 10.14.2 for users participating in the beta system software testing programs. A developer version is typically available first, soon followed by the same build for public beta testers.